Beyond Niamey: Does spelling matter in Bambara ebola materials? 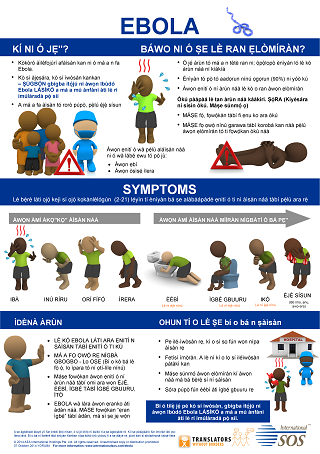 A Bambara version of an ebola information poster - one of a number of translations of an original done by International SOS - shows why review of technical health materials translated into or composed in African languages is necessary (per "2Ds & 4Rs"). While giving due credit for the translation, it is also important for the common ultimate goal of communicating about ebola in the most widely spoken language in Mali to offer constructive criticism towards improving this product and guiding similar efforts. In the case of this poster, it is immediately apparent that the standard Bambara orthography is not used. This is important since the standard orthography is used in adult literacy, some primary education, and various publications including on ebola and other health related topics. In a previous posting on this blog - "More on standard orthographies of African languages"- I discussed in more detail the reasons to respect and make use of the alphabets and rules of spelling adopted in many African countries for writing their languages. In the case of critically important health information on a deadly virus, adherence to standard ways of writing, as well as to as much standard terminology as there may be, would seem obligatory. The resolution of the poster available at this time (from an image accompanying a tweet embedded below, which also includes a French version) is not sufficient to review the content in detail, but is is possible to provide some tentative revisions to the headings (see below the embedded tweet). EBOLA YE MOUBANAYE, ABE DJENSE TIOGODI? EBOLA YE MUN BANA YE, A BƐ JƐNSƐN COGO DI? A BANA BƐ DƆN COGO DI? KA EBOLA KOUNBEN ANI I BEN MUKE NI IBANA NA? It is possible to write Bambara (or any language for that matter) in French orthography. The New York Times, for instance, used the French spelling of the Bambara and Manding term "jatigiya" (basically meaning hospitality) - "diatiguiya" - in two recent stories on ebola in Mali (on Nov. 10 and Nov. 12). And it is true that Bambara speakers schooled only in French (which for long has been the general rule in Mali) may resort to orthographic rules of the latter when transcribing their first language - although it should be pointed out that this often results in different spellings based on the user's hearing and rendering of sounds. This juxtaposition of a language (Bambara) with a historically recent standardized written form, and a large number of the literate population taught only in a second language (French), raises legitimate questions about how best to render Bambara in print for ebola messaging. However the fact that Mali has chosen a particular orthography (much like that used for similar Manding languages in neighboring countries in the region), and that people taught to read the language have been taught in this orthography, would support using this system rather than one based on French phonetics. Keep in mind that people taught to read Bambara in adult literacy classes or in mother tongue based bilingual schools would likely be in villages where they could read the material - aloud i necessary for any community members who cannot read it. As an example of use of the Bambara orthography, note the translation of an ebola factsheet done by the Dokotoro Project and the Mali Health Organizing Project, which was highlighted in an earlier posting on this blog. I also should note here that Bambara can also be written in the N'Ko alphabet, and that there are people literate in that instead or as well. Altogether this is a complicated situation similar to that in the rest of the multilingual West African region, but not one so complex as to make use of first languages and local lingua francas like Bambara in their written forms problematic for implementation. Translation also needs to be accompanied by attention to cultural appropriateness of the material and also, where images are involved, the visual literacy of the audience. Together, these considerations are part of full "localization" of material. It is worth noting in this context that when Translators Without Borders produced localizations of the same International SOS ebola posters in Nigerian languages, they added pants to the figures (which although abstract, appear in the original to be dressed only in t-shirts). A revised Bambara version should probably follow suit. KA EBOLA KUNBƐN ANI I BƐ MUN KƐ NI I BANA NA? instead of "bana na", it should be "banana" (-na is the suffix of intransitive perfective). In a case like this, how do you reconcile creating materials in the local language in a timely manner with using the standard orthography? Will non-adherence to orthographic standards keep the users from understanding the content? Manuela, Valentin, thanks for the comments. Valentin, I made the correction. I had parsed the "na" as in Fula (in Bambara it would of course been "wa"), rather than as the perfective form of the verb "bana". Manuela, Checking the orthography wouldn't be that hard or time-consuming. One solution is to involve people who know how to write in the language in the process (this is one of the ideas behind the Translating Hope initiative. As for understanding of content, it's probably like any language - a misspelling or two probably won't confuse people (unless it's on a critical term or otherwise makes meaning ambiguous). Main problem is that with an anything-goes approach to writing the language, the potential for miscommunication becomes greater. An additional problem is hampering what I see as the potential to re-use the material in other materials. Best to get it right the first time, IMO. There is a spelling/orthography corrector (mentioned in a follow-on posting) which might help in this process.